Today, we've teamed up with Dopapod, one of America's most eclectic jam bands, to premiere their new song, "Numbers Need Humans." "Numbers Need Humans" is the first single from the band's upcoming album Emit Time—which is set for a May 25 release. The song is the band's first new music since their return from a recent hiatus. You can check out "Numbers Need Humans" below. “When I arrived at the studio for the initial recording for 'Numbers Need Humans,' the studio already had a Sunn head running into a closed back Mesa 412 cabinet set up and miked for me," Rob Compa, the band's guitarist, told Guitar World. "I gave it a shot, but I really couldn’t get used to the sound of that rig. At live shows, I’m not super picky about what amps I use, but the recording studio is the one place where I’m pretty particular about that, because every little detail is painfully evident. "Luckily I brought along my 1978 Fender Vibrolux that I’ve been using since I was in college. It’s had some mods done to it, including a blackface mod. The speakers in it are a Weber DT10 and a Kendrick Gold label speaker. We miked both of them and blended the sounds of both speakers. "Both the intro licks of the song and the middle guitar solo are the scratch guitar tracks from that session, going into the Vibrolux. I used my 2005 Paul Reed Smith Hollowbody II, which has been my main guitar for nearly 15 years. My gain for those solos came from an Analogman King of Tone overdrive and a Maxon VOP9 overdrive. We also had the engineer add some delay to those parts during the mixing stage. "When I overdub guitar parts, I like to do it all at home on my own. My recording set-up is laughably primitive, but all I really care about is that I have a sound and am in a place where I’m totally comfortable and can be myself. As long as that’s happening then I’m more likely to create good, musical results." 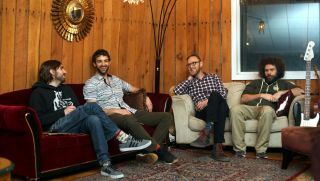 For more on Dopapod, step right this way.